I first came across Pam Wedgewood was from Easy Jazzin’ About. So many of my students love it very much. I found it useful for me to introduce the world of jazz from that book. 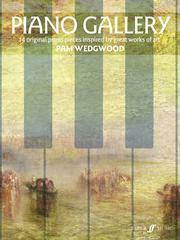 Maybe is a chance now to introduce the world of painting art by using this new book – Piano Gallery. What a wonderful idea. I look forward to playing these pieces as I very much enjoy Pam Wedgwood’s work. Good, I love a Pam Wedgwood book and my students love playing them so I’ll be buying a copy. The book sounds wonderful. I love Pam Wedgwood’s music. The grade level sounds about right for this retired piano teacher to enjoy herself. Classical is my preferred but I have learned much about harmony, rhythm, and phrasing from other jazz works. And wonderful to pair music to art. The world is in need of both! Art and music: a beautiful combination. Thank you Pam. I would love to win a copy, it will inspire my pupils and to further their creativity.